The 2nd Twilight Series for 2018 came to a thrilling end yesterday, with a near collision encounter between Red Rum and Invictus, resulting in a Protest decision from the former. At the beginning, Winds blew steadily from a Southeasterly direction, keeping the fleet compact and competitors on their toes. Subsequent wind shifts and major changes in wind pressure led to a re-shuffling of the boats in the course, and could have been a pivoting factor for some of the results. Despite the initial breeze during the 1st half of the evening, The IRC, Cruising Multihulls and Beach Catamaran Class were left struggling on the final leg up to squance, where the race was shortened due to the strong currents and weakened winds. In the IRC Class, Invictus managed to clinch line honours, but chalked up a DSQ from the ensuing protest by Red Rum. This resulted in a bullet for Jong Dee and 2nd place finish for Red Rum. Skybird completes the podium in 3rd. The result for the 5th and final race for the Series sealed Jong Dee’s victory in the IRC Class, beating Invictus by 2 points. Steve Manning’s Red Rum gained from the successful porotest outcome, securing his position in 3rd. 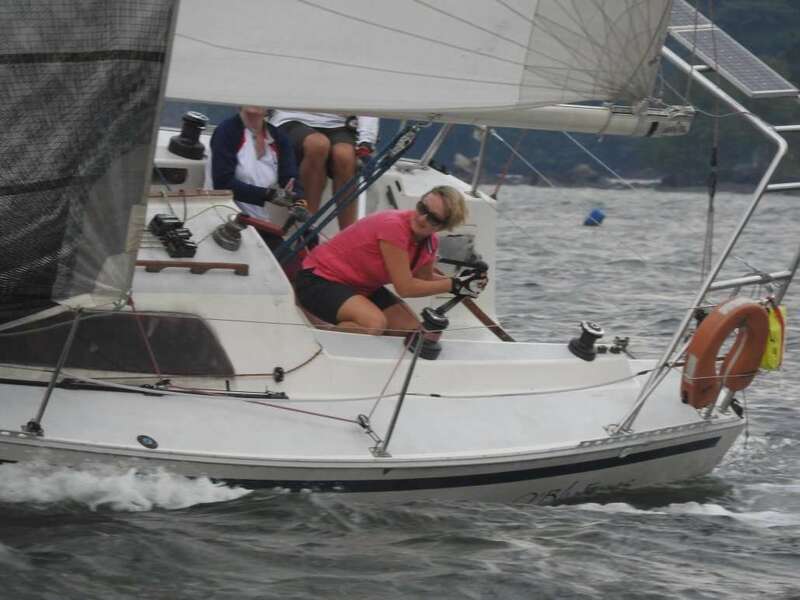 For the PY Class, the race was shortened for an East-West finish at the Club line, giving opportunity for some of the slower boats to finish within the time limit. First across the line and first after handicap correction went to New Blue Eyes, securing their 3rd bullet for the Series. Only a minute separated 2nd placed Minx and 3rd placed Marsh Mellow. Their positions were switched in the final series results, with Marsh Mellow clinching 2nd by 1 point ahead of Minx – a testament of the friendly rivalry between both boats. New Blue Eyes took the PY Title comfortably with a total of 5 points for the Series, putting themselves in the driving seat for the 3rd and final installment of the Twilight Series starting 22nd September. The Cruising Multihulls see Witblits take the bullet by a comfortable lead over Cicak & Baloo (in 2nd & 3rd respectively). Despite stalling at Squance for some time due to the ripping currents and light winds, Witblits eventually managed to finish with 30 minutes to spare. With that, Witblits made all their races count, clinching 3 bullets from all 3 races sailed for the Series, securing the Cruising Multihull Title with 8 points. Eepai came close to dethroning Witblits, but fell short with the lacking number of bullets. Cicak completed the podium 1 point adrift, on 9 points. Chris Waddington’s dominant performance on Persian Cat gave him a comfortable win with 3 bullets and a total of 5 points for the Series. A poor attendance by the rest of the fleet seem to have contributed to the overwhelming victory, and we hope to see better participation from the Beach Catamarans next season! Congratulations to all the winners for the Twilight Series II! We hope you had fun over the past 2 months, looking forward to the start of the 3rd and final Twilight Series for 2018 – commencing on 22nd September!